The Folding Dunk Tank Goes More Places! Description: Don't have space to fit our regular 500 Gallon Dunk tank, no problem. Our folding dunk tank holds 300 gallons of water and can fit in any backyard. 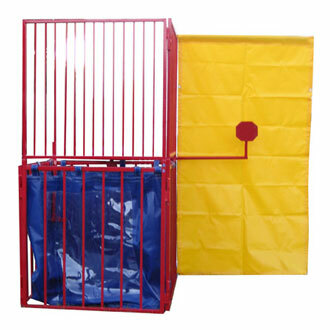 Call today to book our folding dunk tank. This is perfect all types of event where you want to have some fun, all of our dunk tank rental include setup and delivery, they also include 3 balls to be used the dunk tank.